» Free Workbox Tags–New Expanded Set! A customer mentioned to me not too long ago that she wished our tag sets contained a tag that said “Work With Mum” instead of “Mom”. My own mother, who works in a school, mentioned that she’d love to see the days of the week in the sets instead of just numbers. And I came up with a few extra things all by my little self until this tag set ended up having a whopping 56 tags in it! Now… March 1st is National Pig Day. Did you know that? It’s true! (It’s also Peanut Butter Lovers Day… So dip some bacon in your peanut butter and call the day celebrated! In honor of this most important and tasty occasion, I created a new workbox tag set, will all 56 tags in it, for your organizing pleasure. Look at all those cute piggies! 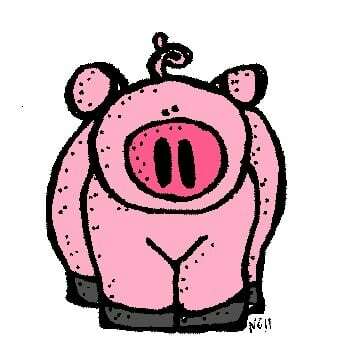 I want to let you know that this piggy was drawn by Nikki, the very talented “doodler” responsible for Melon Headz Illustrating. I hope you enjoy the new tags! Please let me know what you think of the new expanded set by leaving me a comment here or a review at the store! Oh… And Happy Pigs In Peanut Butter Day! Previous Post 60% Off Sale, Winners and a Freebie Next Post New For Spring! Ew. I like bacon. I like peanut butter. I don’t think I’d want to try them together. But cute pig. And nice job on the tags. I don’t know how you keep doing it! lol… I said the same thing! That suggestion was ACTUALLY my husbands. But I stole it for the sheer fun of it :)… And how do I keep doing it? I REALLY needed a break from this endlessly boring and horrible project we’ve gotten ourselves into over here. So I decided to play hooky for a while and make something cute 🙂 I probably should have washed dishes or done laundry or vacuumed up the cereal on the floor, but this was more fun.